Use this Wizard to configure the most common device settings such as locale, security options, applications, MDM enrollment, and production network settings. This Wizard also allows you to connect to a staging and/or production network, reboot the device, or update the OS. 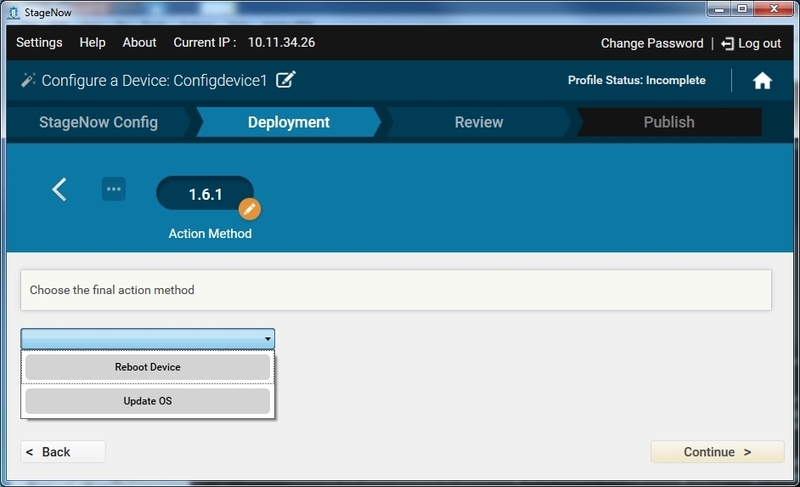 Select the Configure a Device Wizard, and select Create. To choose to connect to this network using StageNow bar codes, select Yes, and then select Continue. Otherwise, select No to skip to the RD Config section (if available). Note that the RD Config section only appears if you turned on Legacy Mode in the Settings screen. See Rapid Deployment (RD) Client for more information. If you chose to connect using StageNow bar codes, see Profiles / Connect Network for instructions on connecting to a network and populating the settings window. Note: This Wizard includes a Deployment section. Deployment requires that the host computer and the device(s) are on the same network. 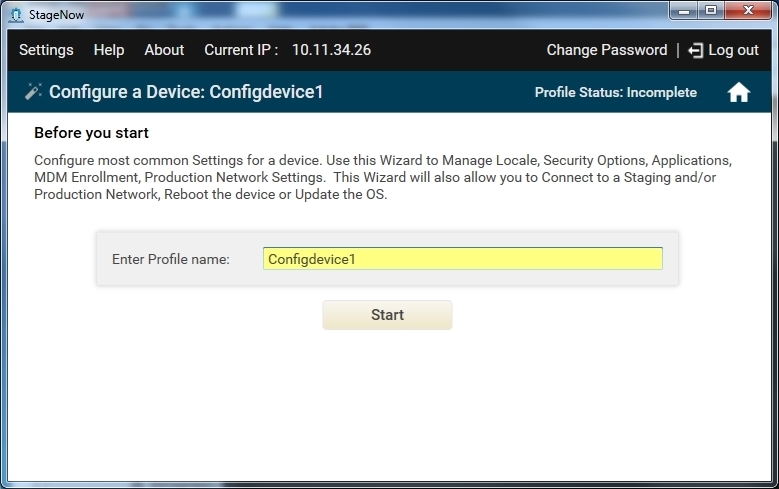 In the Deployment section of the wizard, select whether to configure the device. If you select No, proceed to the Review window. Select whether to manage applications. If you select Yes, see Profiles / Manage Applications for instructions. Select whether to configure device security. If you select Yes, see Profiles / Manage Device Security for instructions. Select whether to localize the device, set the current locale, and set the default input method. If you select Yes to any of these, see Setting Types / UiMgr for instructions. Select whether to enroll in an MDM. If you select Yes, see Profiles / Enroll in an MDM for instructions. 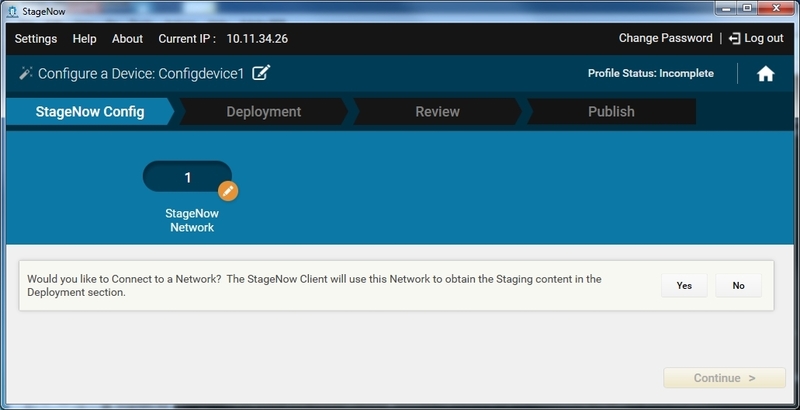 Select whether to connect to another network to use after staging. If you select Yes, see Profiles / Connect Network for instructions. Select whether or not to reboot the device or update the OS. If you select Yes, select either Update OS or Reboot Device. If you select Reboot Device, see Setting Types / PowerMgr for instructions. If you select Update OS, see Profiles / Perform OS Update for instructions.